Haaaa! Life is good. 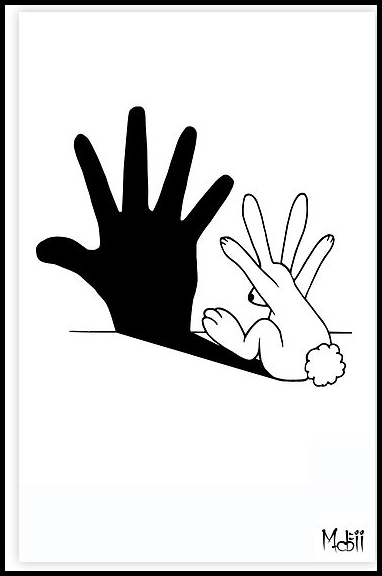 A guy named Justin liked the Rabbit Hand Shadow design. That's always good, of course. But, this is better, because he wants to sell them in his shop in the U.K. They have an online Facebook page called Buxton and Buxton. Now, you may be thinking, "Ok, so what? A guy bought a few cards.". Well, yeah, a guy bought a few cards, but these will end up in a real brick and mortar place. This means that not only was Justin really really drunk last night, but now, the bun is out of the shadowy gray internet realm, and into the real world. The bun unleashed could cure cancer, stop world hunger, end war, and definitely make your old lady look much more attractive when she does that "I'm wearing your shirt as a nightie" thing. The possibilities boggle the mind.